Update: On Saturday, Pete Buttigieg announced his campaign had reached 65,000 donors and would be eligible for the debates. A new Democratic Party rule meant to help candidates who have grassroots support looks like it will vault two dark horses onto the stage for the primary debates — which begin in just three months. Last month the Democratic National Committee announced two ways to qualify for the first two debates, in June and July. One way to earn admittance is to poll at 1 percent or higher in three separate polls of either Democrats nationwide or those in primary states. The second, which has opened a window for candidates without a lot of name recognition but with grassroots support: receive donations from 65,000 people, including at least 200 from each of 20 unique states. 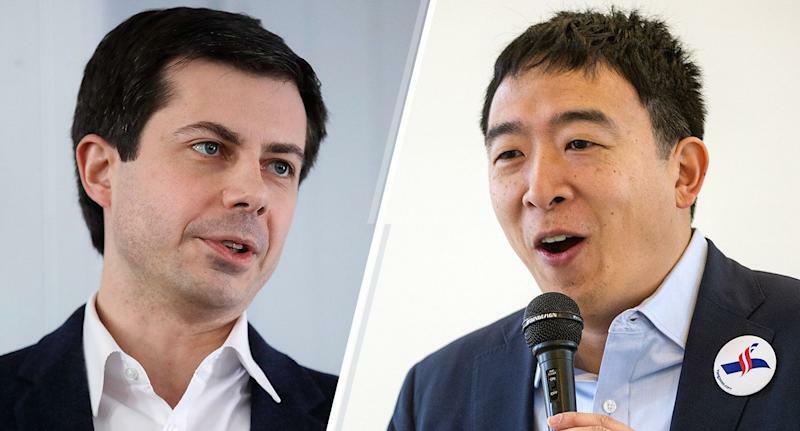 The candidates who seem primed to benefit are tech entrepreneur Andrew Yang and South Bend, Ind., Mayor Pete Buttigieg. Yang, who has been pushing a universal basic income policy, announced earlier this month that he had already passed the 65,000-donor threshold and set a goal of 200,000 by June. Buttigieg is getting close, riding a series of well-received media appearances to more than 55,000 donors. (The donation section on Buttigieg’s website includes “Will you help us reach 65,000 donors, and prove that this new generation of leaders belongs in the conversation?”) Buttigieg’s campaign announced a major boost after he appeared on a CNN town hall Sunday evening and netted $600,000 from more than 22,000 donors in 24 hours. Pro-Yang memes began to spread across social media platforms and message boards as interest grew in his UBI plan, which would provide $1,000 checks every month to every American over age 18. While some of that support for his plan has come from darker corners of the internet aligned with the so-called alt-right, Yang has not courted that support. At the age of 37, Buttigieg has combined an almost comically impressive and unique biography (gay, Harvard-educated Midwestern mayor and Rhodes Scholar who served in Afghanistan) with a strong grasp of policy and genial demeanor that has impressed in the town hall and interviews with “The View,” “Morning Joe” and podcasts from Crooked Media and Vox. An additional advantage for Yang, Buttigieg and any other lesser-known candidates is that Democrats are not holding two-tier debates, the way Republicans did with their almost equally crowded field four years ago. In that race, the highest-polling candidates participated in one primetime debate, while the lower-polling candidates preceded them in what many referred to as a junior-varsity debate. Democrats will allocate positions randomly, meaning that dark-horse candidates could get the exposure of appearing alongside higher-polling contenders like Bernie Sanders or Kamala Harris. The debates will air on consecutive weeknights in June on NBC News, MSNBC and Telemundo, exact dates still to be decided. CNN will host the second debate in July. · A Monmouth poll found 13 Democrats polling at 1 percent or above, including two candidates who already said they weren’t running (Sen. Sherrod Brown of Ohio and former New York City Mayor Mike Bloomberg) and two candidates who are yet to announce (former Vice President Joe Biden and current New York City Mayor Bill de Blasio). Yang earned 1 percent in the poll. · A Morning Consult poll released this week found 13 announced candidates at or above 1 percent, plus Biden. · A poll of likely Democratic caucus goers in Iowa found nine announced candidates, plus Biden, at 1 percent or above. · A poll of Democrats in Michigan found just eight announced candidates, plus Biden, with at least 1 percent. Calculating which candidates meet the donor threshold is complicated; in federal reporting, candidates are allowed to lump together contributions under the $200 reporting threshold in a single line item as "unitemized contributions.” Candidates can choose to list each donor individually or announce them, as Yang and Buttigieg chose to do. After Bernie Sanders launched his 2020 run, the Sanders campaign announced that 225,000 had donated in the first day. The DNC may change qualifications as the debates go on to trim the field — lack of voter interest and funding may handle much of the culling for them as the months roll on — but the opportunity for candidates like Yang or Buttigieg to get primetime attention could shake up the race in unexpected ways.